Certified Public Accountant – Michael E. Rink of Rink & Robinson, PLLC was recognized on January 6, 2016 for five years of service as a board member with the Catawba County United Way. 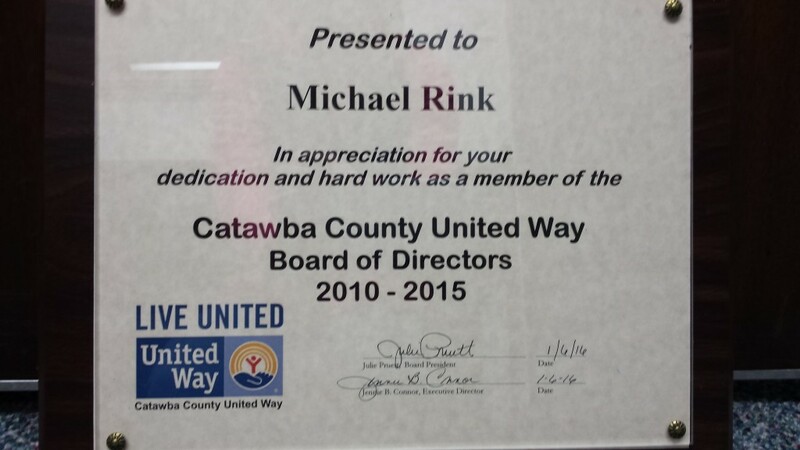 Mr. Rink has been proud to serve with others and supports the mission of the Catawba County United Way. Michael wants those to know that the vision of Catawba County United Way is to be the most effective and efficient organization that identifies and prioritizes the greatest unmet human needs in the community, focuses human compassion, and mobilizes resources to meet those needs. He says that the Catawba County United Way has brought together people and resources to build a safety net to help meet the needs of our friends, neighbors, co-workers and families. A constant reminder that when we as individuals think outside ourselves, we have the power to facilitate change. When we think of others’ lives as linked to our own, our compassion grows. When we reach out a hand to one, we influence the condition of all. We build the strength of our neighborhoods. We bolster the health of our communities. And we change the lives of those who walk by us every day. clients of the Hickory community to give to the United Way.